When will I find out who my new MP is? Labour activists at Amber Valley saying it could be as close as 2010 when two recounts were necessary. Election trivia to keep you awake as you wait for the results to roll in. People queuing up to help count the votes in Stoke-on-Trent. The Telford and Wrekin count. 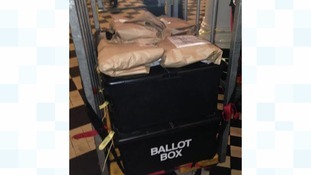 The first ballot boxes arrive at the Hereford and South Herefordshire count. Stoke South ballot papers arrive. These are the times that each election area declared the result in 2010 - the last General Election. West Midlands political landscape: where are we now? As the polls close in the West Midlands, a reminder of the current political landscape. East Midlands political landscape: where are we now? As the polls close in the East Midlands, a reminder of the current political landscape. The results for the Midlands electoral areas beginning I > P as they are declared.